Don't worry about rushing! And if you've a paypal/account/whatever we could send money to buy you a coffee don't hesitate to put it up! Pertaining to the race ending stuff - I've got a few pointers for the codeblocks that control those so could dig through my notes to find them if you did wish (but I think it's mainly the "round complete" as opposed to "select winners" code which mightn't be useful). The ASM side of things is pretty ambitious as it's a real mess for Mario Kart. GOOD LUCK - and good luck also with getting your feet back after the move!!! I might send out my paypal later, but I don't feel like I've done enough lately to get any sort of recompense for my actions. My original thoughts were that there were some hardcoded references to the portrait images that get messed up when the new images are introduced, and then an image is improperly loaded. However, the truth is that there's actually some strange table (maybe related to text effects) embedded into the Text Bank that I either exclude or move somewhere else when the ROM gets exported from Pitstop64. Strange that it's the text that messed up the ROM and not the Kart images, but that's how it is. 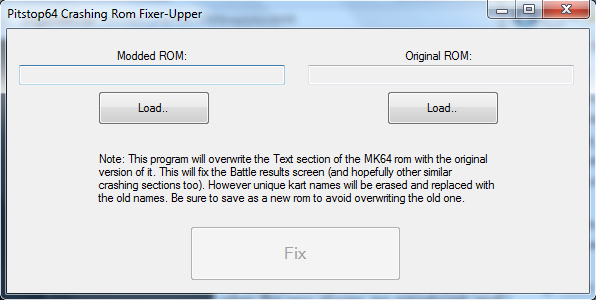 The workaround I mentioned is to revert all the Text data to the raw ROM's version. It'll erase any changes made to it, but it'll fix the crash. TLDR; I can fix the crash, but in exchange you have to revert any Text-changes you made, like character names. I'll do some more investigations to figure out how to bring this into Pitstop64. I'm not 100% sure this fixes the end of the Grand Prix issues, but I believe this fixes the battle mode. It did for me. I can confirm that this fixed all the problems in every mode. Great work! Credits and download in video description. Online play with a friend. (15-09-2017, 06:30 PM)Wariuzzo Wrote: I can confirm that this fixed all the problems in every mode. Great work! Wariuzzo that is exceptional work! I'm thrilled to see what you've managed to do! And also really happy to hear that the crash problems are solved! (15-09-2017, 11:47 PM)MRKane Wrote: Wariuzzo that is exceptional work! I'm thrilled to see what you've managed to do! And also really happy to hear that the crash problems are solved! Without your kart setup I would not even be halfway of the work. (16-09-2017, 12:11 AM)Wariuzzo Wrote: Without your kart setup I would not even be halfway of the work. The next challenge, of course, is getting the rigging working in blender. Out of interest: what did you use to do the character select animations? (16-09-2017, 04:28 AM)MRKane Wrote: Out of interest: what did you use to do the character select animations? I drew every frame in photoshop. It's 100% original and made just for the mod. well done Wariuzzo, good work with Wiggler. Maybe he will still use Zouzzz's tool to change the acceleration, weight and speed (that's the personal touch you might want in your character), because I still think this new character continues to have the same skills as Donkey Kong. what program do you use to play Mario Kart64 online? I use Project64 kaillera and the reason for my question is that I can not select my rom of Mario Kart 64 with Banjo to play online, because the modified rom does not appear in the list. I have already updated the list of roms but still does not appear and for that very reason I am very surprised that you can play Mario kart 64 with Wiggler online. I have not been able to prove his character yet. the problem is that I do not know what kind of file is Wiggler.kart I do not know what kind of file it is or with which it opens, nor if it can be applied with some program to patch. I would like that pistop or some other program could create patches to then apply them and that people can upload their patches and this way everyone can test the work of others and above all that would allow patch patches already patched in case people wants to keep adding things in the future. is it possible to add any such feature to your mib_f8sm9c program?